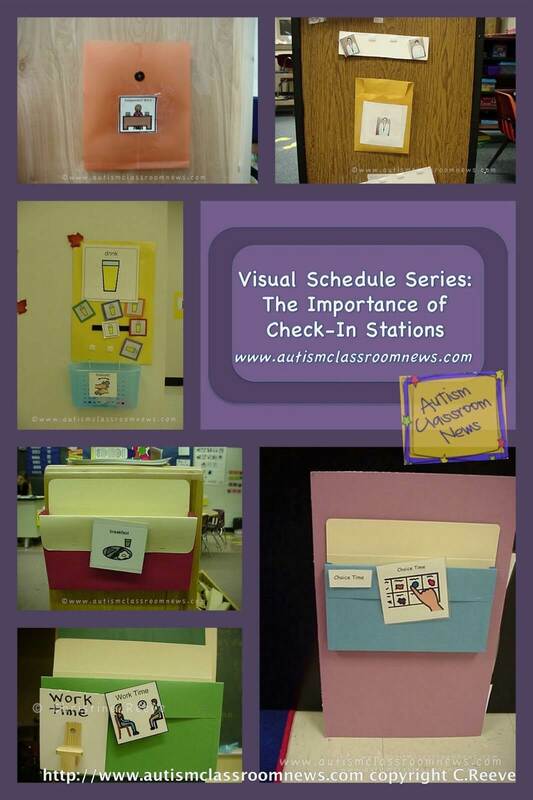 Individual full-day visual schedules continue to be the topic of this part 2 post in the series on visual schedules. You can read the last post with other examples here. We talked a little about object schedules in the last post, which you can see in the second schedule to the left in the picture below. Wondering what the Mickey Mouse thing is going on there? Those are color-coded check schedule / transition visuals. The staff grabs each child’s transition visual and takes it to him or her while saying, “Check your schedule.” The student then takes the transition visual to his or her schedule and puts it on the top of the schedule to check in to the schedule. 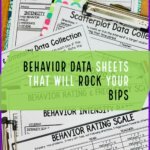 It’s a great system for students who are just learning to check their schedule. In this picture you can see typical top to bottom schedules and you get to see what we did before we had color printers (OK, stop laughing–it wasn’t that long ago). We printed or copied (yes we used to copy them from books before computers, when we didn’t draw them) the visuals on colored copy paper. The color coding is used for a variety of reasons. First, for preschoolers (which is where this picture was taken), the color makes it easier for them to locate their own schedule. Little hint–it’s also much easier for the adults. 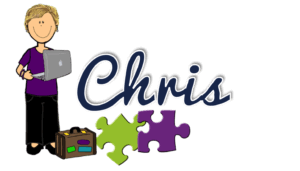 The color coding is also carried through the classroom so that his chair is labeled with the same color, his cubby has the same color, etc. 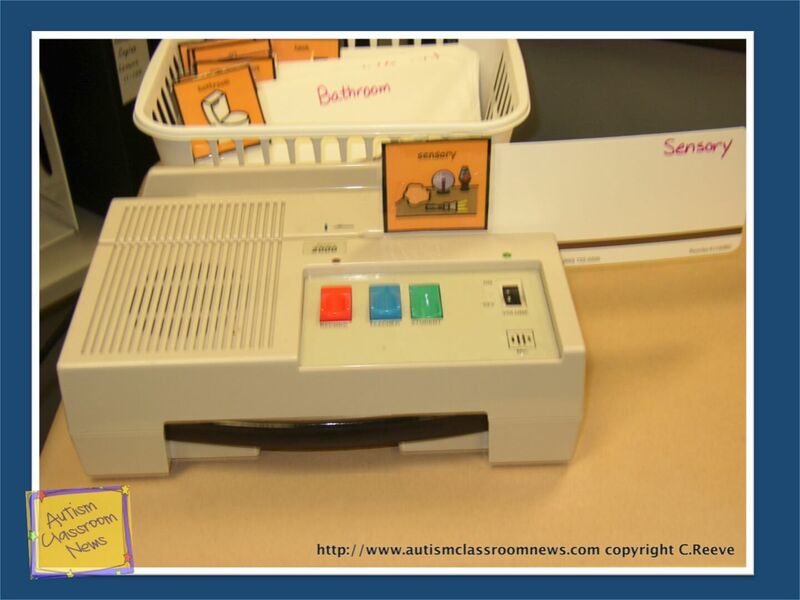 This increases independence because the student knows where to go in the classroom based on his color. And again, I assure you that it doesn’t just benefit the student. Finally, you can see in this picture that the students turn over their schedule visual when a task is finished. This way they can tell that the next one with the picture facing outward is the next activity. 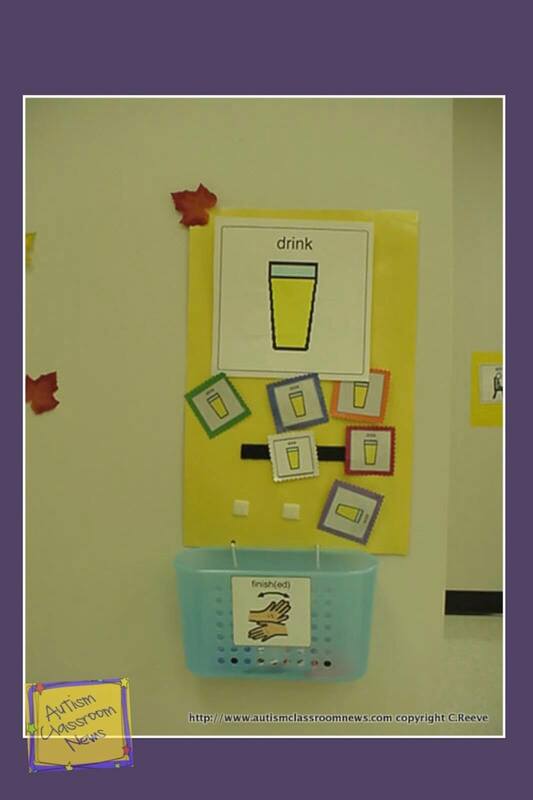 This works well for students who are able to move from the schedule to the activity area without needing a reminder. For other students, you would want them to carry the visual to the area and check in to help them understand the connection. This student was able to read, but still really needed the activity of carrying the visual and checking into the activity to make it to the right place independently. So we made him a schedule with written words. We put matching words on the check-in stations (along with the pictures for other students in the class who needed them). 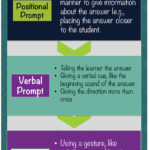 He was able to know where to go without the pictures, but you want to make sure that the student really comprehends the words before switching him to a written schedule. Remember that the schedule should always be easier to use than the child is able on his BEST day. This means it can be used easily on his worst day independently. The picture below is for another reader. However this student didn’t need to have a manipulative to carry with him in the transition. He was able to read and check off the schedule with a dry erase pen. The board stayed on the wall for a consistent place to check it. Every morning, we gave him a schedule. He would write it on the dry erase board as part of his morning work. This also gave him an opportunity to review the schedule at the start of the day, which helped with his anxiety. And finally this schedule was for a middle school student who needed small pictures in addition to the written word. She needed a portable schedule that could move with her around the school. 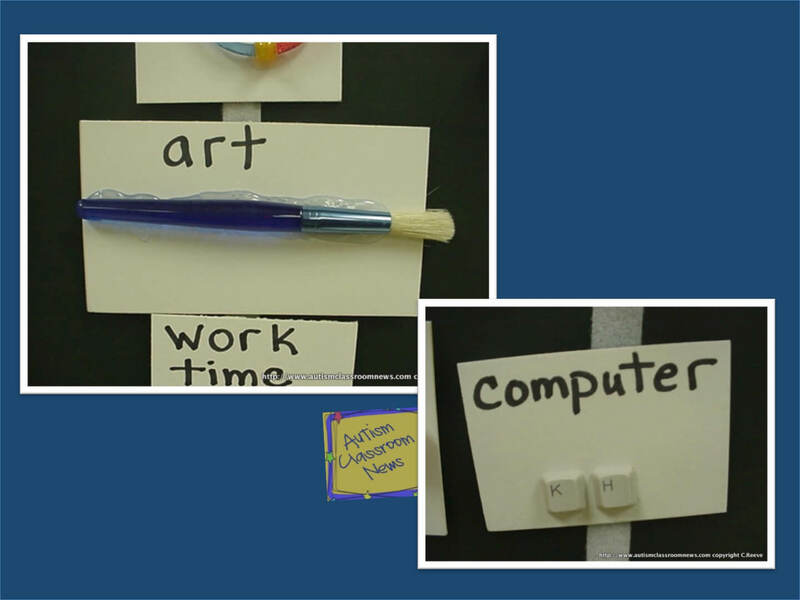 We created the schedule with Boardmaker with written words and tiny pictures because she was not able to use a written schedule alone independently. She could read the words but didn’t always know what they meant or where to go. We also found that using Velcro to fasten the pencil to the clipboard was critical to assure she had a way to check things off. She would check off the gray box to the right of each word. Once the schedule was more settled for her, we put the schedule in a page protector and used a dry erase pen for her to check it. This meant we didn’t have to print a new one out each day. However, if you have a student with a goal for independently using his or her schedule, a hard copy of word product would be a great method of data collection. Of course, now a days, you could just take a picture of the schedule at the end of the day with your phone and use that as documentation as well. So that gives you a taste of the way individual schedules can be used and the variety. In the next post, I’ll focus on the use of group visual schedules. 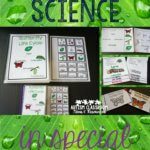 In the meantime, check out my visual schedule bundles for all ages on TPT if you are interested the schedules that you have seen in some of the pictures, . 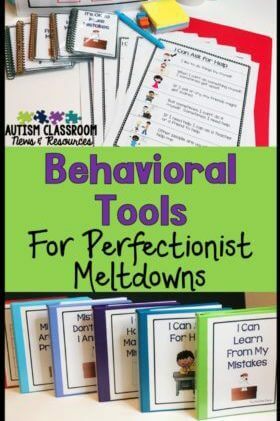 The books linked below are also useful to get started with visual schedules. 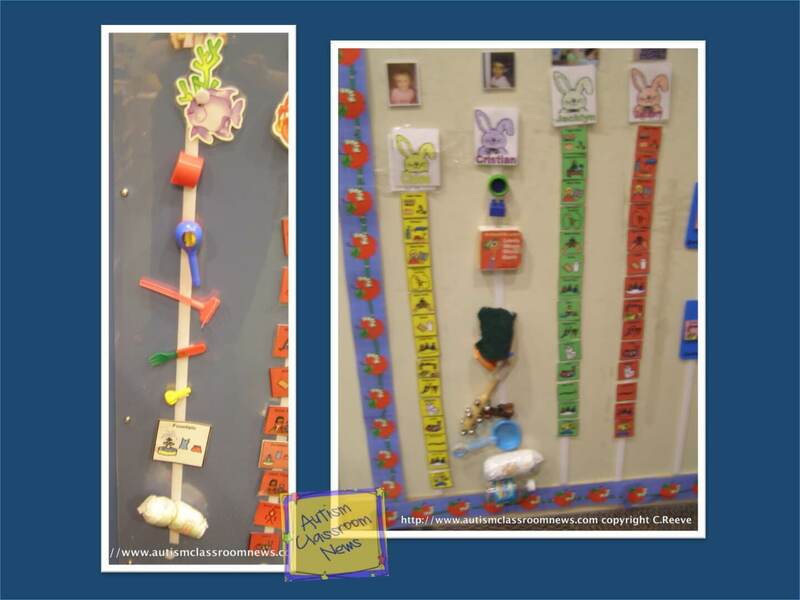 Then, hop over to the next post in this series to see more examples of visual schedules. Disclaimer: The books below include affiliate links that gain me a small commission but cost the same to you. I have used all the links and only recommend the ones I find useful. For more information, see my copyright and disclosure policy. Thanks Laura! I just started following your blog. Stay tuned…more schedule posts are coming. That sounds like an awesome adventure. I will talk about group schedules next, just for you!